(NaturalNews) Yet another study has come out linking pesticide use to the severely diminishing honeybee population; researchers found that 57 pesticides were present in the European honeybees that they studied. This finding is cause for concern, as it suggests that the harmful chemicals play a significant role in their massive decline around the globe. After all, colony collapse disorder, which started rearing its ugly head around 2003, is a serious problem. Just in the U.S. alone, beekeepers reported annual colony losses up to 45 percent between 2012 and 2014. What makes that problematic is the fact that much of our food supply depends on bee pollination. Quite simply, fewer bees means less food. Since the dwindling bee population remains an ongoing concern, it's safe to say the world has been facing a facing a crisis regarding this matter – a crisis which continues to this day. "Bee health is a matter of public concern," said Tomasz Kiljanek, lead author of the study from the National Veterinary Research Institute in Poland. "Bees are considered critically important for the environment and agriculture by pollinating more than 80 percent of crops and wild plants in Europe." Expert: Pesticides can "weaken bees' defense systems"
Although in 2013 the European Union restricted the use of neonicotinoid pesticides – ones that target the nervous system of insects – there are still some pesticides that are allowed and currently being used. These are the ones that the researchers looked into; liquid and gas chromatography with tandem mass spectrometry helped the researchers identify different pesticide substances. However, it should be noted that, because there are so many pesticides in use, it's a challenge to determine what pesticide substance in particular is responsible for harming bees. To further complicate the issue, some pesticide combinations or their use over time may affect the bees in different ways. Still, Kiljanek explains that finding pesticides in honeybees is cause for concern. "Even at very low levels, pesticides can weaken bee's defense systems, allowing parasites or viruses to kill the colony," he says. The study, published in the Journal of Chromatography A, notes the severity behind the problem. It states: "Pesticides are widely used as plant protection products (PPPs) in agriculture. In Poland, there are more than 1500 PPPs authorized to use, which contains at least one of 200 different pesticides, very diverse in terms of chemical structure and toxic effects on bees." The study continues, homing in on the effectiveness of the aforementioned liquid and gas chromatography method: "Fifty seven pesticides determined in poisoned honeybees clearly confirms the right selection of compounds and applicability of this method. It is the broadest spectrum of pesticides and their metabolites till now detected in honeybees. It is also a tool for establishing the cumulative risk for bee health caused by a mixture of pesticides that could be present in honeybee body, by interactions between themselves and between pesticides and other epidemiological factors." According to the study, the top "three of the insecticides detected in most poisoning incidents were organophosphates: chlorpyrifos (38 samples), dimethoate (30 samples) and neonicotinoid clothianidin (22 samples). The most commonly found fungicides were systemic ones as tebuconazole (18 samples), cyprodynil (13 samples) and thiophanate-methyl (12 samples)." You can review a more complete breakdown of the specific kinds of pesticides found in honeybees in the study at this link. 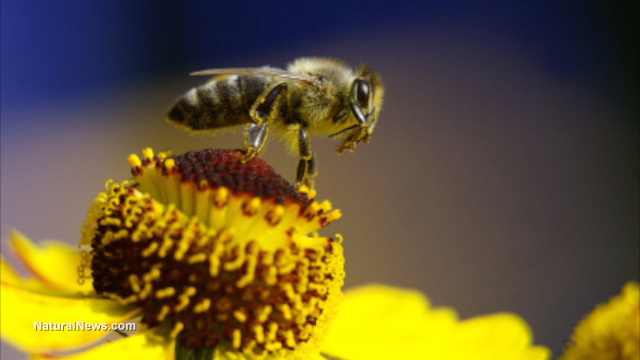 The takeaway from this study is that pesticides are detrimental to bee colonies everywhere. Even the Environmental Protection Agency engaged in its first-ever scientific risk assessment study which examined the threat that neonicotinoids pose to bees. It was found that imidacloprid, the most common neonicotinoid, existed in the nectar which some bees brought back to the hive. Approximately one-third of the human diet comes from insect-pollinated plants. Considering that 80 percent of that pollination comes from honeybee activity, studies like these serve as a huge wake up call for there to be more pesticide bans in place. The future of our food depends on it.